Sometimes I forget, dear neighbors… I forget that this blog is not just about recipes and the places I love. But then reality hits and I remember it’s about sulfites and living sulfite-free. Recently I have been contacted via my French blog and on several occasions, by people who struggle with the same issue. Some of the people who got in touch with me have been « officially diagnosed », real progress since we first became aware of the problem, five years ago ! Unfortunately, while sulfites are now identified as potential triggers of asthma, hives, swelling of the tongue, eyelids, migraines, loss of smell and taste, no one, as far as I can tell, has really looked into the « why » or « how » : why did my husband, for one, become overly sensitive to them ? Was it genetic? I doubt it – or maybe I married a mutant ? My hypothesis is that he ingested too many non natural sulfites over the years (well hidden in processed food) and one day his system was on overload and could not process them any longer. Now maybe – just maybe – someone in the scientific community will stumble upon this and decide to start researching the long-term impact of sulfites on the body: do we even eliminate them? These are all questions I would love to see answered. Back to reality. One of the main problem for those of us who have to deal with any kind of food intolerance is traveling without getting sick. Actually, it applies to any trip outside of our comfort zone, namely our home, such as a hospital stay. 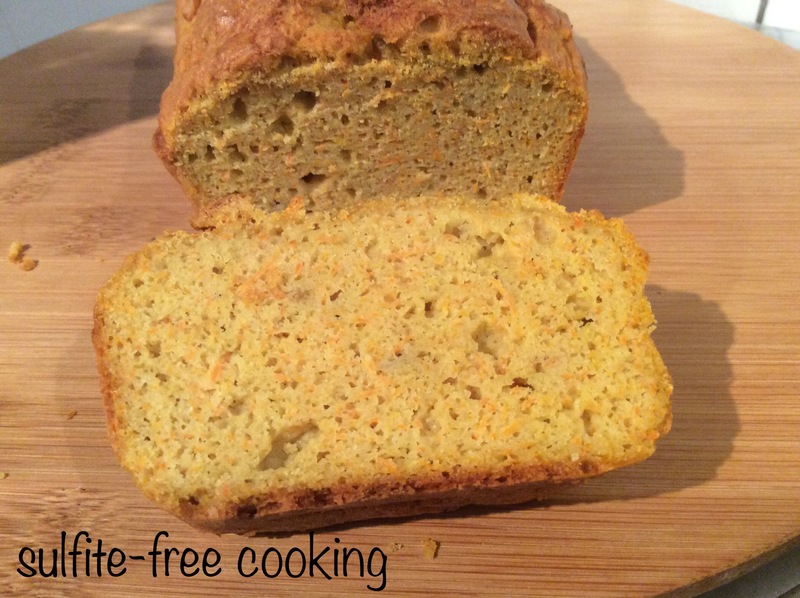 Here is a recipe for a savory cake loaf which keeps better than bread, provided you keep it well wrapped. At home, we eat it with a green salad or a soup. When traveling, it is nice to have with a cup of green tea or home-brewed coffee, kept warm in a thermos. At the end of this post I will give a list of the types of “survival” food I make when we have to leave our home for more than a few hours. 2. Grate carrots and add to beaten eggs along with fenugreek, salt, and oil. 3. Add flours and baking agent / baking soda and lemon juice. 4. Pour into lined greased baking pan and bake for about 45 minutes. Test for doneness with a knife – when inserted should come out clean. The sliced loaf can be enjoyed hot, warm, cold, or even toasted! – spring rolls… or autumn rolls! As always, any other ideas are welcome, dear neighbors: don’t forget to comment if you want to share them! It’s that bothersome Dear Neighbour of yours again. Bringing emergency food supplies whenever you go out is very much like me these days. One of the things I’ve found useful is one of those, now ubiquitous, fruit and nut bars, but this one has no dates, no histamines for Jack, and it’s also Sulphur dioxide and sulphites free according to the site. I’m not sure how available they are near you or if they’d even be suitable for your Husband, just thought I’d share. The bread looks wonderful, it’s funny I never added anything in the way or spices or blends until recently to bread. It just wasn’t something that you’d do in bread making here. Never too late to learn I guess. Until later, take care. Thank you very much, you are so nice to care. I will look up the fruit bars, although I have never seen this particular brand in my neck of the woods. I have not had the time to read you latest posts. Translating this one from the French, contacting several food suppliers and then posting their replies on my “Produits avec ou sans sulfite” page has kept me busy, not to mention experimenting in the kitchen of course – my teff pasta is coming along, thanks to your original buckwheat pasta recipe, my second try, tasted great… but I used some rice flour as well as tapioca starch so I am not sure it would be good for you. Did you stats spike for your buckwheat sesame cookies??? That was me! Have a nice weekend, dear neighbor! I really appreciate you taking the time to read my ramblings. Hopefully as the garden starts to produce the recipes might become more interesting again. Take care! A pity! I’m okay with the bars, but grapes are a no go for me too. Perhaps your husband and I were dastardly duo of villains in our previous lives. Chucking grapes at the poor and stealing loaves of bread!